By now you’re probably sick of hearing me boast about how magical shrubs are. I apologize, it’s just that when I start talking drinks I tend to go a bit overboard. Guilty as charged. While I won’t go into all the reasons why I’m in love with this beautiful elixir (we’d be here all day) I would like to highlight just one: cocktails. Shrubs are the perfect cocktail ingredient – sweet, tart, bold, delicate, complex, fruity . . . ok, ok, you get the idea. They’re just begging to be stirred and strained. 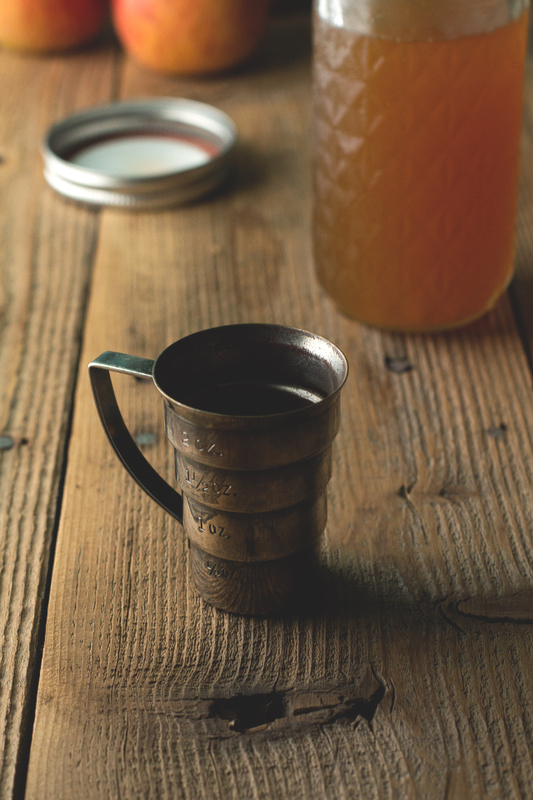 Today I mixed you up something special to put that apple shrub to good use. The acid in the shrub plays nicely off the sweetest of the applejack and the nocino, not to mention keeps you coming back for more. And we both know there’s nothing wrong with that! 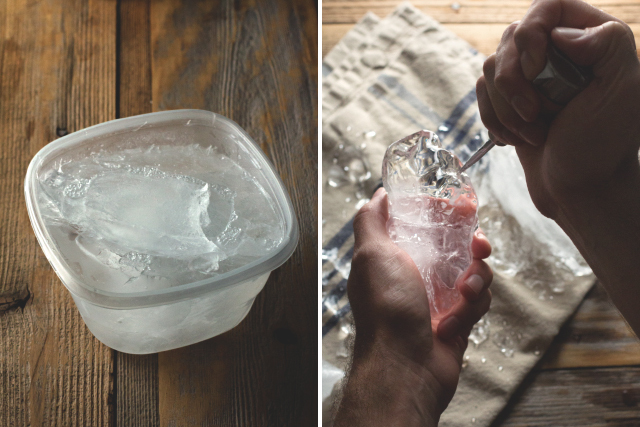 If you want to follow along and carve your own big funky piece of ice, do so in advance of mixing your cocktail. I filled a medium-sized tupperware with water and froze it overnight. The next day, when I was ready to make my drink I went to work with my ice pick and made a few custom rocks. Now you’re ready to make the cocktail (I love that phrase). 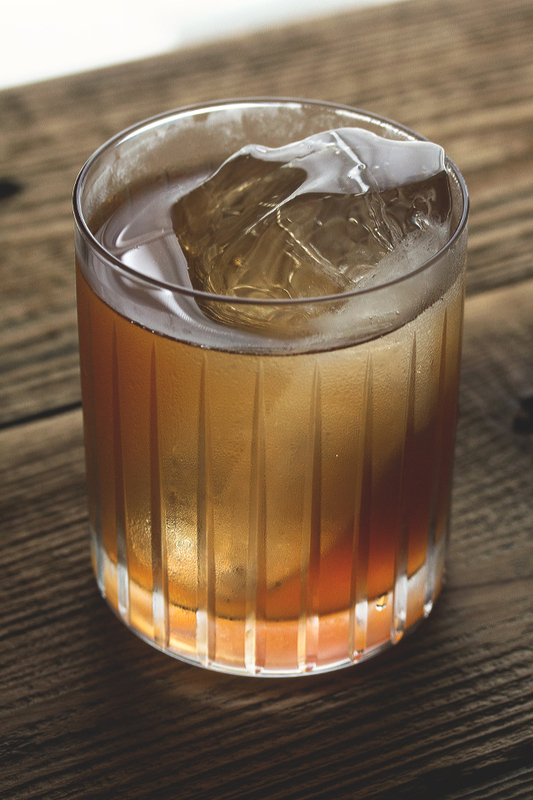 Go ahead and grab the apple shrub we made the other day. 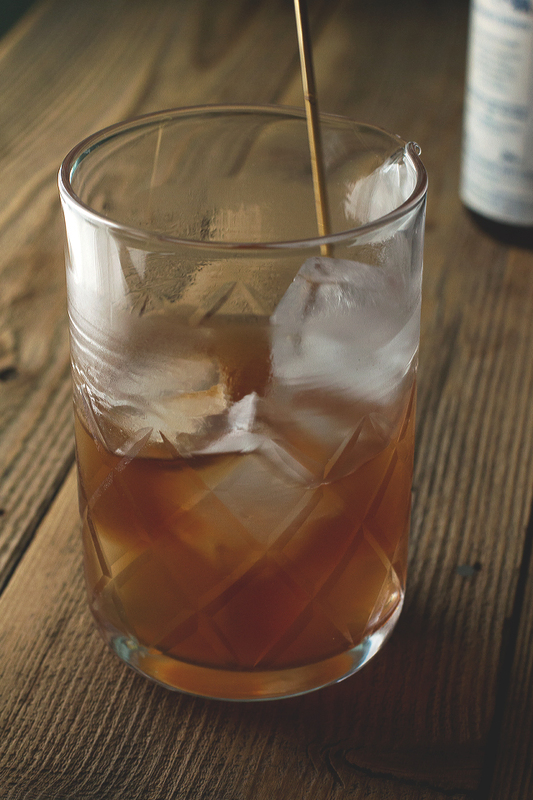 Add the apple shrub, applejack, nocino, and bitters to a mixing glass full of ice. 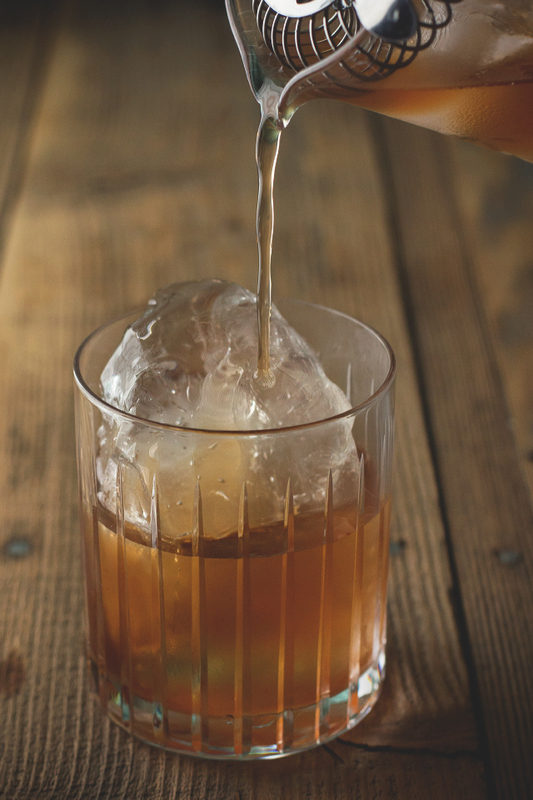 Strain into a rocks glass over a large cube of ice. No need to garnish this beauty. 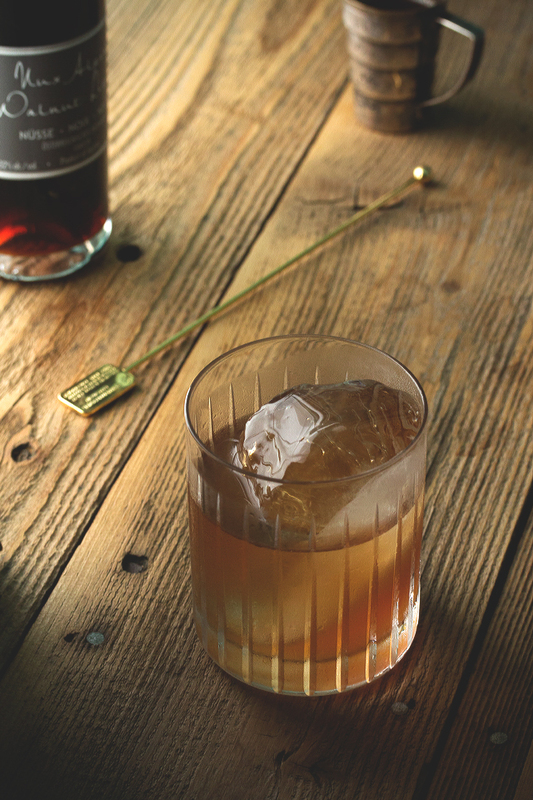 Kick your feet back, relax, and let the shrub do the talking. 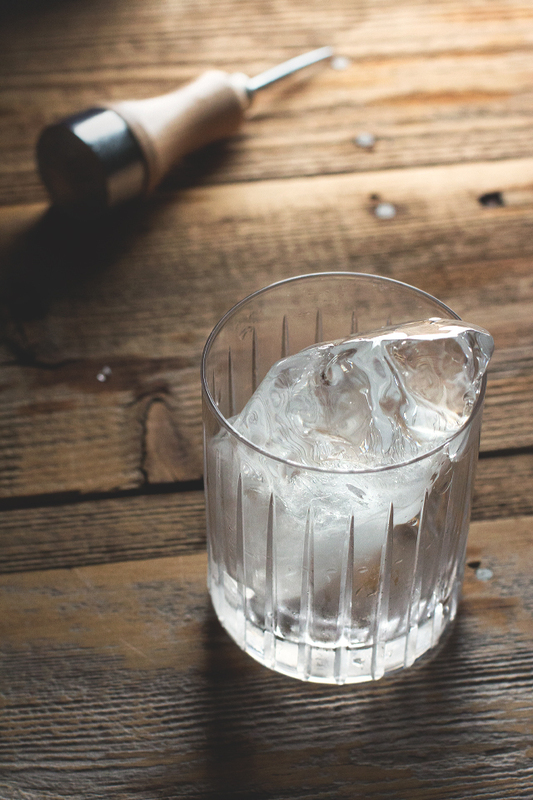 Strain into a rocks glass over a large cube of ice. No garnish. 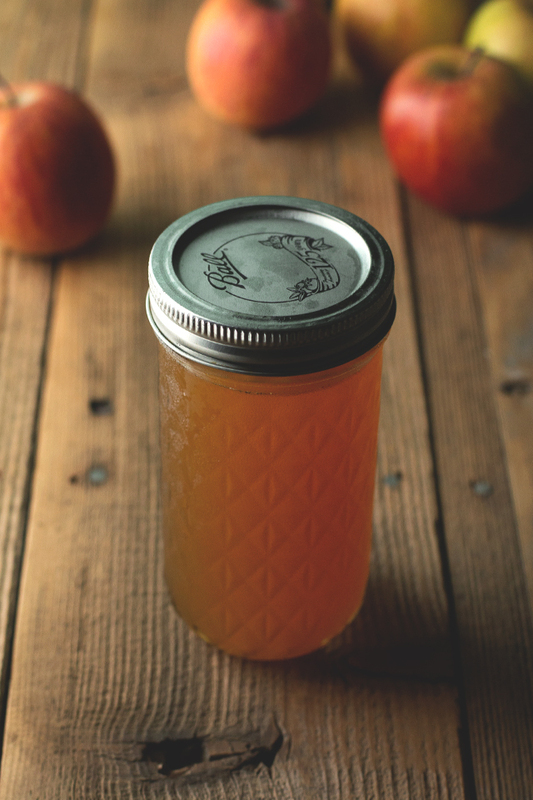 Looks fabulous – I’ve never tried apple shrubs! It’s pretty amazing stuff, Averie. Especially for this time of year. Add some to a little warm apple cider and call it a night. this is incredible, I love the shrub, but those custom ice ‘rocks’ are pure genius!! Mmmm this looks good. If I didn’t have nocino, is there another liqueur I could use instead? Hmm, good question Brandon. Well it does add the primary sweetness to the cocktail, so definitely something sweet. You could try some orgeat if you have that. I have a feeling frangelico might be too overpowering. Maybe just some simple syrup and a splash of sherry.. Totally gorgeous! I need one now! Holy cow Todd! This just screams fall afternoon, enjoying a football game or just sitting on a sunny deck. Just delicious, and again your photography is amazing! Thanks! Thanks for the recipe ideas and maxi ice tip. It’s Spring down here in Sydney so I’m thinking more summer cocktails. Have you tried the Shrubs made with Australian indigenous fruits from Currong Comestibles? Great mixer flavours and a great intro to ‘ Oz Bush Tucker’. Seriously gorgeous, love your custom rocks! I’m so into apple cocktails, it just screams fall to me! Also, your barware is on POINT. Love. I’m totally going to make this soon Todd. I made a strawberry shrub in the summer that was fantastic, even just with some soda. Also, I haven’t seen anyone use nocino in a cocktail in years! 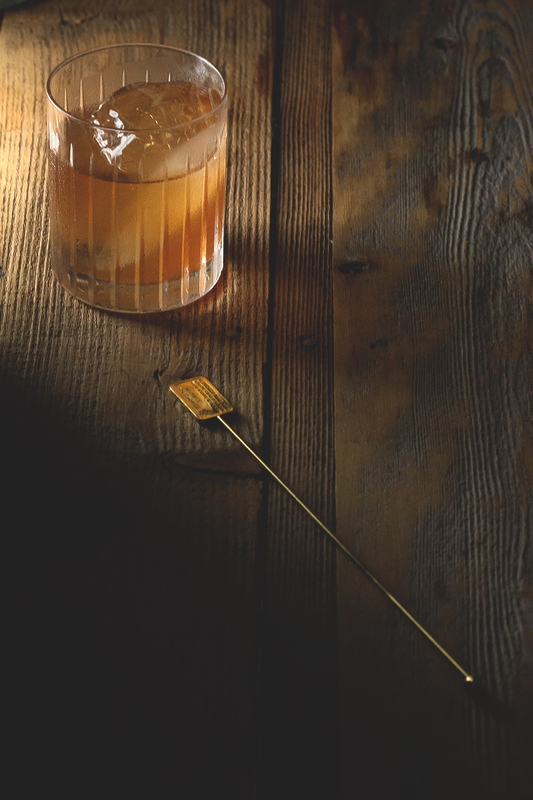 One of my favorite (no longer existent) bars in SF used to make a cocktail called the Bourbon & Maple with bourbon, maple syrup, nocino, and bitters. Of course you’ve heard of it, Vijay! That makes two of us. I’m gonna try to make some of my own here at home soon I think. I’ll let you know how it goes, and I can share you the recipe if it’s any good. LOVE me some strawberry shrub. And that’s exactly how I finished up this batch – just with a little plain soda water. Yum!